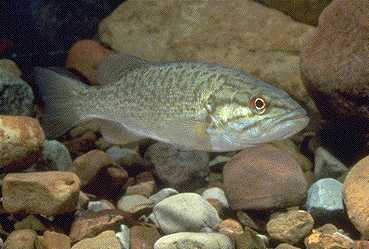 The smallmouth bass is one of the main fish species in the sunfish family. As a member of the group commonly referred to as the “Black Bass”, it is a very popular game fish that is chased by bass anglers throughout the USA and Canada. The Smallmouth has been spread beyond its natural range by stocking efforts to many rivers and lakes in the USA and Canada. The original native range extended to the upper and middle Mississippi River basin, the St. Lawrence River and Great Lakes system, and all the way up into the Hudson Bay basin. In addition to this natural range, smallmouth are now stocked in rivers and lakes throughout Canada and the USA. Florida and Louisiana may be the only states that do not have a smallmouth populations. The smallmouth is highly regarded for its fighting ability when hooked - old fishing journals referred to the smallmouth bass as "ounce for ounce and pound for pound the gamest fish that swims". Smallmouth bass are sometimes taken for the table fare but most fishermen practice catch-and-release to help improve fish populations. The smallmouth is generally brown with dark vertical bands rather than a horizontal band along the side. There are 13-15 soft rays in the dorsal fin. The upper jaw of smallmouth bass extends to the middle of the eye. Male smallmouth are relatively smaller than the female and tend to range from 1 to 4 pounds. In comparison to a female which can grow from the 3 to 6 pounds and larger. The size of the smallmouth also are different from water and water due to the longer summers in the southern range compared to a much shorter season here in the northern range. Their habitat plays a significant role in their color, weight, and shape. River water smallmouth that live among dark water tend to be rather torpedo shaped and very dark brown in order to be more efficient for feeding. Lake living smallmouth however tend to be a light yellow brown to adapt to the environment in a defensive state and are more oval shaped. The smallmouth is found in clearer and cleaner water than the largemouth. The strive in streams, rivers, rocky areas, stumps and the sandy bottoms of lakes and reservoirs. The smallmouth prefers cooler water temperatures than its cousin the largemouth bass, and may be found in both still and moving water. Because it is relatively intolerant of polluted water, the smallmouth is a good natural indicator of a healthy environment, although it can adjust to changes in water conditions. Like all game fish the smallmouth is a Carnivore and its diet mostly comprises of crayfish, insects, zooplankton and smaller fish. The female can lay up to 21,000 eggs, which are guarded by the male in his nest during the spawning period. The smallmouth first moved outside their native range during construction of the Erie Canal in the 1820‘s. This extended the smallmouth’s range into central New York state. Stocking efforts began during the mid- to late 1800s, smallmouth were transplanted to lakes and rivers throughout the northern and western United States and as far as California. Shippers found that smallmouth bass were a hardy species that could be transported via rail in buckets or barrels by using the railroad water tank to aerate the fingerlings. They were first introduced east of the Appalachians just before the Civil War, and afterwards transplanted to the New England area. During the industrialization period many of our nation's eastern rivers were dammed, polluted, or allowed to silt up thus raising water temperatures and killing off the native brook trout. Smallmouth bass were often introduced to these rivers that were now too warm for the trout. The smallmouth slowly became a very popular game fish. The smallmouth also was able to adapt to large, cool-water impoundments and reservoirs and they began to spread far beyond their original native range. Soon though the smallmouth population began to decline due to years of damage caused by overdevelopment and water pollution. The continued loss of river habitat that was caused by dams that were built in order to form lakes or reservoirs also contributed to the population decline. Today, a renewed emphasis on preserving water quality and riparian habitat in the nation's rivers and lakes, along with much stricter management practices eventually benefited the smallmouth populations and has caused a resurgence in their popularity once again. The Smallmouth Bass is also commonly known as Smallmouth, Bronzeback, Brown Bass, Brownie, Smallie and Bronze Bass. With so many names for one fish, you know it has to be popular. If you have never experienced the excitement of a smallmouth at the end of you rod, I highly recommend that you give it a shot. Like the Largemouth, it will stir your passion for bass fishing to the boiling point.